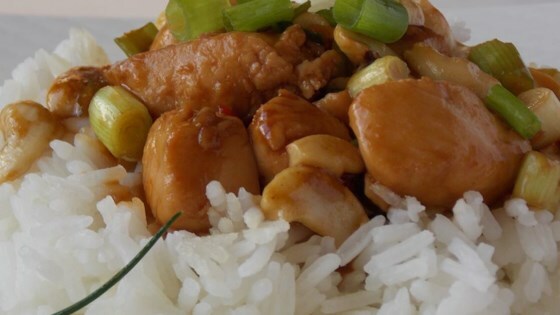 "A spicy, Thai style chicken dish with flavours of cashews, spring onions, and soy sauce. Serve over rice." Heat sesame oil in a wok, and add cashews. Once brown, transfer cashews to a bowl. Set aside. Add chile peppers to wok, and sir fry for 20 seconds. Stir in chicken, and season with pepper and salt to taste. Cook chicken until no longer pink. Stir in soy sauce, fish sauce, and sugar. Simmer for 5 minutes, or until chicken is cooked through. Stir in cashews and green onions, and stir fry for 2 minutes. I thought this dish had potential but was way too salty. Next time I will cut back on the fish sauce and add more sugar. Also I think I will add some rice vinegar. I wish I'd read the reviews before making this recipe. It was way way too salty I would cut back on the fish sauce by at least half. I thought this was okay But I added some Mustard and Butter to it and I thought it was'nt bad afterward.